We breakfast at Papa John’s on the aforementioned Connaught Drive, which is a restaurant attached to a small backpacker-ish hotel (The Astoria). The decor is interior log cabin, but the food is tasty and plentiful. Our view over the road is of the famous Rocky Mountaineer train, which sadly doesn’t move for the duration of our meal. In fact there doesn’t seem to be very much activity round it at all, so maybe its departure time is some way off yet? After breakfast we head off on the road in the opposite direction to the one we came in, toward Whistler Mountain. At this point there’s a deal of cloud about, but also a fair bit of sunshine. After negotiating a few steep inclines we come to the cable car station. This appears to be more of a gondola-style car, beloved of James Bond movies, which rises vertiginously over the car park and up the mountainside. With tickets purchased we wait with a few people to board. It’s a walk-in gondola that operates on the one up, one down principle, and which stops at each end making it easy to board. We have an operator with us, a young girl in a Ranger uniform who can’t be that long out of high school. As we set off she gives a running commentary about the mountain, the cable car and the National Park. But to give you an idea how quickly the weather can change, about halfway up the mountain it starts to gently sleet. As we climb, visibility falls this turns steadily to snow and then rises to a crescendo of mixed hail and snow. We’re all slightly amazed, but our pilot seems unfazed. It’s probably a regular occurrence for her. However, as we get close to the top station we come to a sudden stop, with the gondola left swaying in the middle of the snowstorm. A walkie-talkie crackly informs the guide about something to do with the braking system. She again seems unbothered, which is a good thing because the station seems within touching distance and the drop below appears to be hundreds of feet. I think it would have been a deal more scary without her on board, stopped as we were in midair and with the snowstorm outside. After what seems like ages, but is actually more like 10 minutes, we set off for the last few feet. Unsurprisingly, given the sudden loss of visibility, a large queue of people are waiting to embark as we get off. 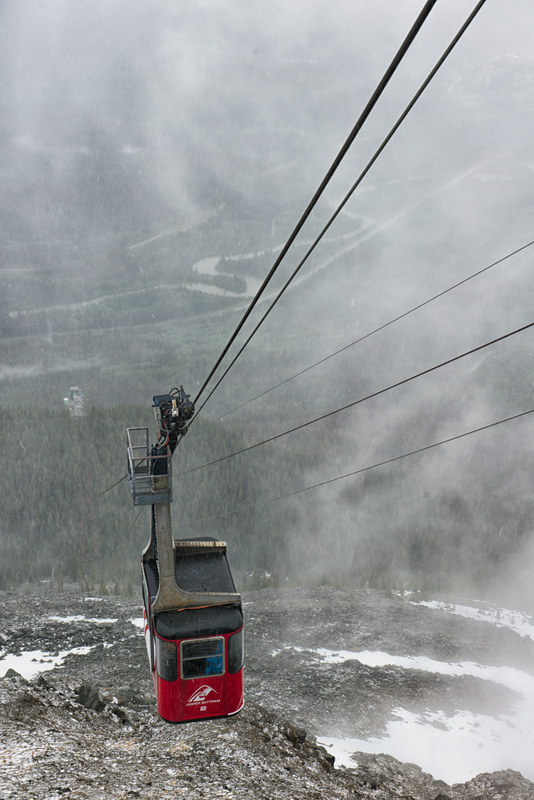 The Whistler Mountain cable car rises up through a clearing snow storm. So now we’re on top of a mountain, inside a cloud with zero visibility, and it’s snowing heavily. The departures lounge for the ‘down’ cars is packed with people seeking escape. Luckily the top station, although small, contained a cosy cafe on the upper floor. We decamp there to drink coffee and hot chocolate and stare at the clouds for a while. We’re not really attired for subzero hiking, so an attempt to walk the 1/4 mile or so to the summit is not on the cards. Eventually, after an hour or so and somewhat more refreshment than planned, the clouds begin to thin and we get glimpses of the valley below. I dash out into the snow flurries and try to take some pictures, not entirely successfully I think. We’ve pretty much exhausted the delights of the top station and its cafe and gift shop so make the decision to head down. Ominously, the up cars are all arriving empty, so the ride isn’t tempting folk from below. I think that means we’re limited to how many the car can carry down (or it may be a hangover from the brake problem we had earlier). Either way, as there’s still quite a few people waiting to go down, and with reduced capacity, it’s a couple of cars before we’re able to get on ourselves. 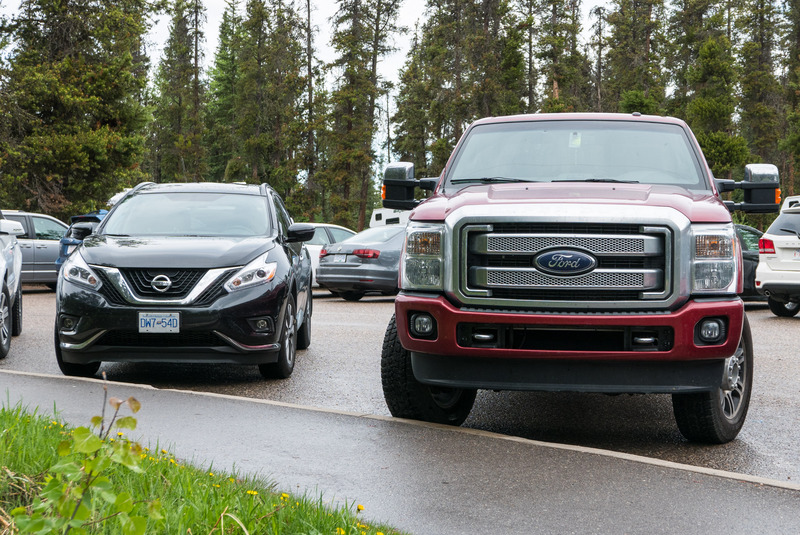 Typical American truck next to a typical ‘rest of the world’ SUV. Safely down from the mountain we head back through town and back down the Icefields Parkway. 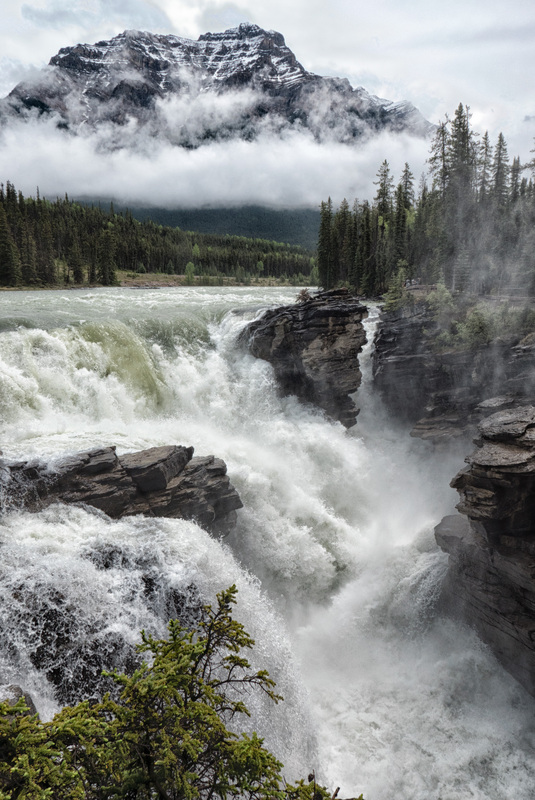 Destination is the Athabasca Falls we missed yesterday. Sadly the weather has deteriorated down here too and it’s a bit drizzly now. It’s not far to the Falls though, literally just off the Parkway, and we get out for a look round. In the car park is one of those big car, little car juxtapositions that are always amusing to European eyes. The Falls themselves are pretty intense and very loud. We’re actually level with the top of the falls and the outflow from the lake plunges into a chasm and dives under the main highway. If anything it’s a little too close to photograph. It’s all quite magnificent and all that, but it doesn’t take that long to exhaust the possibilities of looking at falling water. 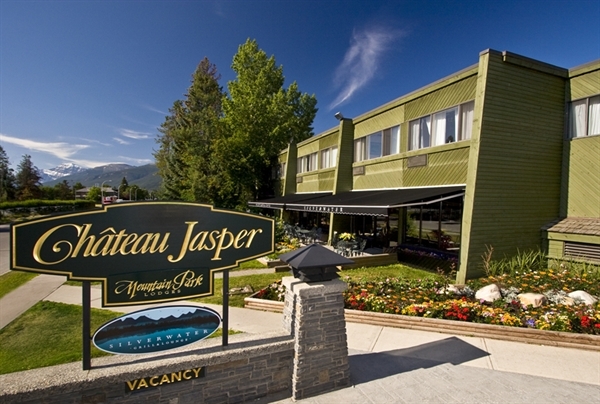 We therefore take the decision to head off for a gander of Malign Lake. 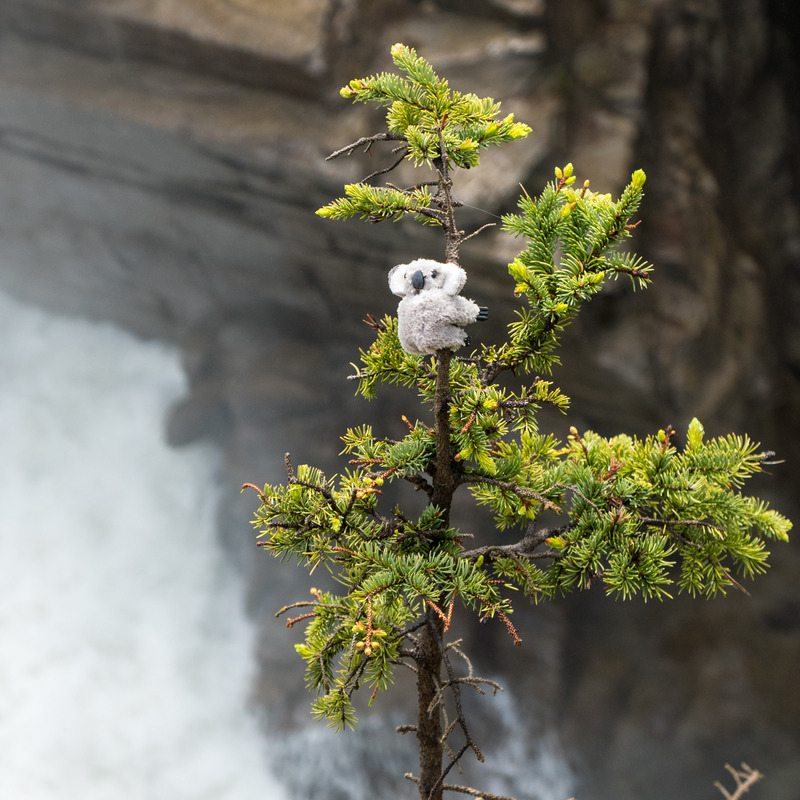 Some ‘stralians must have visited Athabasca Falls. whoever placed this little fella took some very serious risks to do so. 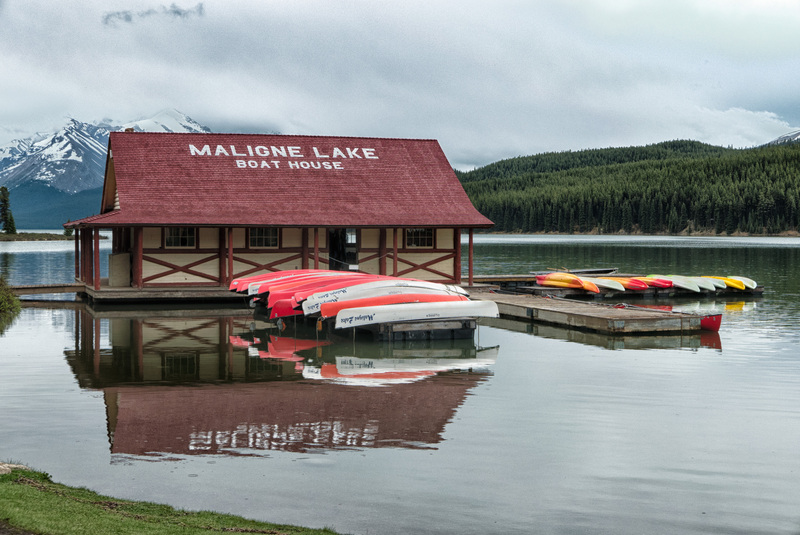 Now for some reason I got it into my head that Malign Lake wasn’t very far away; just a short drive up a side road off the Yellowhead Highway, beginning not far from the edge of Jasper. Maybe 20-25 minutes drive? Wrong. It turned out to be a good 50km and an hour’s drive, which just goes to show how confusing google maps can be when you haven’t noticed the scale! It’s not far in the scheme of things, especially not in Canada, but it’s a long way to sit and look at an essentially empty landscape of trees and lakes and not much else. There were some distractions though, firstly in the shape of our fellow travellers on the road. Every time an animal was spotted, a ‘car scrum’ would form. At one point three bears, (but maybe not THE three bears), were all ambling along near the side of the road. About 15 cars jockeyed for position and the number of near scrapes was amazing to behold. There was even one chap with a selfie stick, out of his car, approaching one of the bears backwards so he could stay in shot himself. I though this kind of idiocy was the stuff of legend, but it seems not. We all sat and waited for the bear to eat him. Luckily for him a couple of park rangers turned up in their truck and essentially told him not to be so ‘kin stupid (or words to that effect). We moved on. Another distraction were a couple of areas where a vast forest fire had raged. Acres and acres of trees were burnt, and only their blackened trunks remained. It was very sobering and eerie. Eventually we reached the lake itself. It was getting fairly late in the afternoon by this time and even if we had wanted to take a boat trip on the lake, it wouldn’t have been possible. It was still nice to stroll by the lakeshore for a little while, get the drive out of our legs, before having a look at the gift shop and the cafe. It’s a nice enough place, well organised and fairly busy despite it being a little cool and damp out. The place definitely had a ‘winding down at the end of the day’ feel, so after some refreshments we headed back out to the car park with a view to starting the long drive home. Stood right in the middle of the car park (we were in one of the emptier parks at the side) was the deer you see in the photo below. No more than a dozen feet away, and whilst wary, seemingly unconcerned about running away from me and my camera. It was amusing to look back on the drive up from Jasper, where the slightest glimpse of a deer would have caused a near pile-up of vehicles, and here in this quiet car park round the back of the cafe, I get the deer to myself. 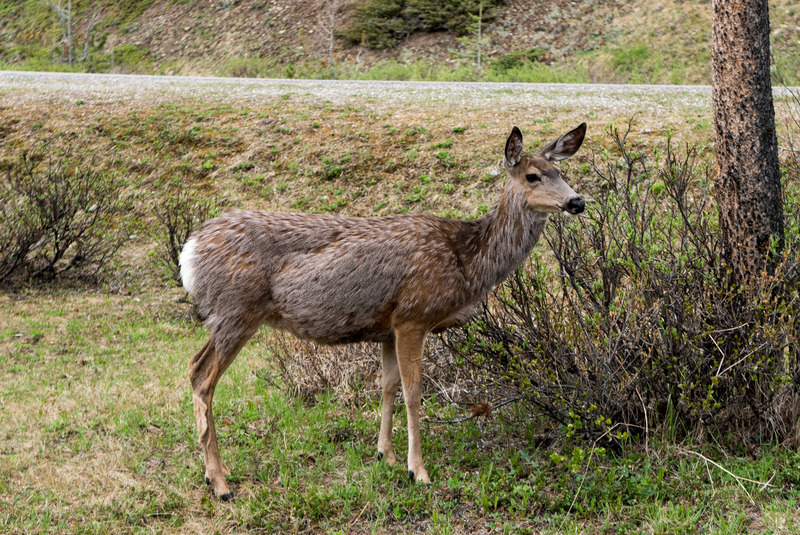 Eventually it wandered further away and joined another two deer, who all ambled over to the one of the access roads and stood nonchalantly watching the double-takes from passing cars. A fitting end to the day’s travels as we headed back to Jasper and some tea.